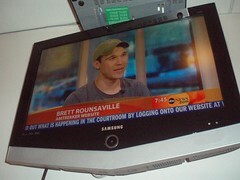 I had to wake up at the crack of dawn yesterday for the Good Morning America interview. I know when I say crack of dawn I usually MEAN noonish…but this time the sun wasn’t even up when I was. This way of thinking was compounded when I got to the studio in Times Square and my name wasn’t on the list for security. I got to stand around wearing my backpack and a stupid grin while people ran around trying to find someone that had heard of me. Of course they did but before I even had time to enjoy more than a couple sips they whisked me off to “hair and makeup” and told me to leave it behind. The blue mug it came in said “Good Morning America” across the front and for some reason that’s one of the few memories that still sticks out. Everything else that happened for the next few minutes was so ridiculously surreal and amazing that I’m still having a hard time processing it. I had to watch the actual segment earlier today otherwise I wouldn’t have a clue what I had said. After we shot for the show I was hustled off to another location in the building where I did my first ever radio interview. It was for the Good Morning America radio program on XM Satellite Radio and I remember that portion a little more clearly. I was definitely talked to about how the radio host couldn’t believe how polite I was to “The Donald” and I definitely expounded on how petrified I am of feathered dinosaurs. 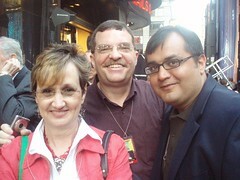 Back to the greenroom where I met Linda (not Laura as some careless travelers would have you believe), Frank and Suneet who would later be mistake for my parents and my bodyguard! They were all super nice and were there as guests of one of the producers to check out the Mariah Carey performance. And as fun as that was I think the highlight of my day actually came as I was trying to leave the studio. A huge crowd had formed outside the doors thanks to everyone’s favorite glitter encrusted diva and I had to get to “my car.” So, despite the fact that I’m basically a homeless bum with a firm grasp of technology one of the security guards pushed his way through the crowd ahead of me saying, “Your car is this way, sir.” As the throng of bored people stared at me trying to figure out why I was important. And then “my driver” drove “my car” to the nearest Chinatown bus where I dropped fifteen bucks to sit uncomfortably wedged in a seat for the four-hour trip up to Boston. Back to being another average vagrant! If you want to help out you know where to click! I think what you are doing is wonderful!!!! However I would like to see you do a story on being a stay st home parent!! That’s hard!!! I think it would be a unique story to document!!!! Not too many people understand what it is to do so….. contact me if intrested!!!! I forgot to add, I have a nice home with a comfy bed for a few days in Gainesville FL…. Home of the Gators!! Even if you don’t want to go with the stay at home parent idea you can stay at my home!! FOR FREE!!! If you are in the area!!! I would like to help you since I can’t do what you are doing I may as well offer what I can!!! I haven’t had a chance to watch the GMA segment yet, but I do have it recorded and will show around to everyone that happens to come near my tv! To answer – Yes, your friends are big enough douches to build up all that false hope and then squash your dreams as entertainment. However, this is more likely if you ever get engaged; Less like limo to NYC, more like kidnapped in the back of a stolen school bus to vegas. @kurleej17 Thanks for the offer! It’s nice to see that there’s someone out there that uses exclamation points even more than I do. @Kristy: Awesome! I’ll keep you posted! If you click on the URL link below, you can get a DVD for the April 25, 2008 segment that you were on. Where are you now, today being July 15, 2008? So I just stumbled on your site, and dude, I like it. I'm guessing your done now, as all 50 things are marked off. I wonder, do you go around writing books now? Everything on the list is done but there will still be new videos coming out for awhile and I'm working on making a whole new trip happen!